Yep! Great book really!! Very practical with gripping story! Enlightening at the same time. I learned quite a few things which changed the way i felt about life. I am still half way, and have already listed n no of things to improvise in myself 🙂 NO doubt, it’s an awakening. Thanks a lot Saakshi for spreading the message of the book. Everyone reads books but very few actually spread the message they find good. Through this blog you have contributed towards making this world a better and joyous place, which is the intent of the book. I am honored to have your feedback. Your work is commendable and must say it actually helped me find my inner sparrow. I am still on my way through the book , and can see a lot of changes in my perception. 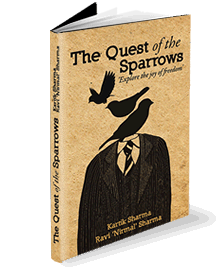 Both me and Kartik hope that the sparrow in you flies so high that it becomes a great story in itself. And then it would you who would be telling your story to us! Wish you the very best in your very special journey! Thank you Sir for your blessings. Fingers crossed.